For a burger place that originated in the tourist-driven Wisconsin Dells I wasn’t expecting much in the way of quality at Monk’s Bar in Grill. The local chain has four locations – two in the Dells, one in Baraboo and the newest one in Middleton. The fact that the parking lot was almost completely empty on a Friday night in the fall made me nervous, but the waitress told me Middleton High School was playing in some high school football playoff game that night so they had been very slow all night. The menu wasn’t a surprise – mostly burgers and fried appetizers with a couple wraps and salads. 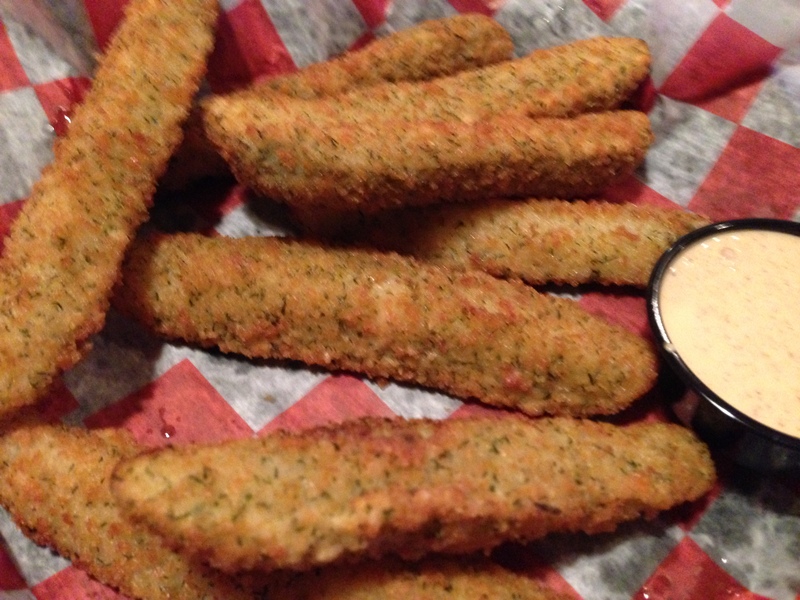 I’m a big fan of fried pickles and tend to judge a restaurant on the quality of their fried pickles if they have them on the menu. So when I saw Monk’s had them on the menu I had to get them. There must be some food distributor in Wisconsin that sells frozen fried pickles to restaurants because I’ve had them at a couple different places. Unfortunately, that’s what Monk’s pickles are. They are the same thin spears with the dill batter that any restaurant with hot fryer oil can perfect. They were good (they always taste the same) but disappointing at a local chain. The surprising thing is the order came with a lot more than normal. An order of pickles (if they’re spears) usually comes with five or six; at monk’s you get 10! For main-meal options, I figured I had to get a burger since that’s what they’re known for and there were a lot of options to choose from. 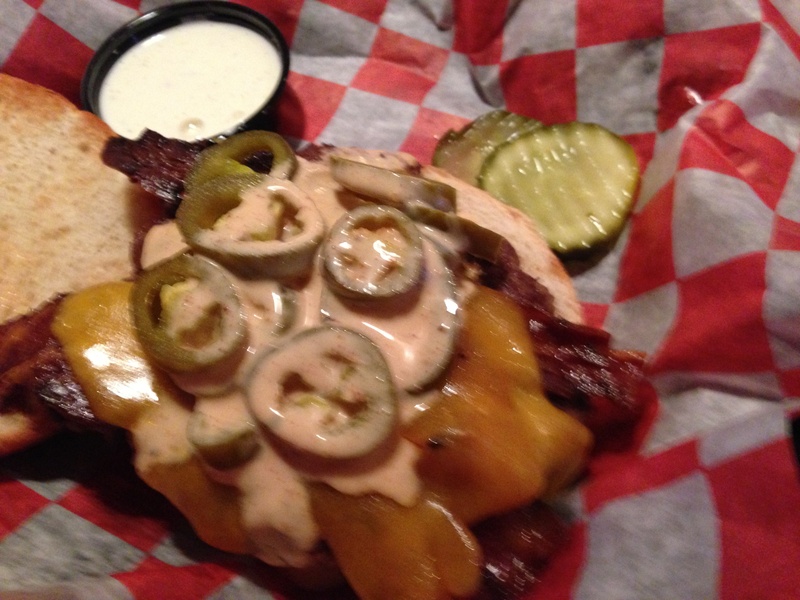 I like spicy food so I got the jalapeno bacon burger, which is an original Monk’s burger (a fancy name for a generic burger) topped with jalapeno bacon, cheddar cheese, grilled jalapenos and spicy ranch dressing. When the burger came out the first thing I noticed was how big it was. The spicy ranch was a good compliment to the grilled jalapenos. The bacon was perfectly cooked and the burger itself was cooked nicely. The burger was so big I took half home and ate it the next day for lunch. The best part of the Monk’s menu is that you can upgrade your side to a premium side of cheese curds, onion rings or monkey fries. The monkey fries appetizer description says they are premium beer battered fries loaded with gooey melted Wisconsin cheddar cheese and crispy chopped bacon, served with a side of ranch – “enough to share.” So when I upgraded my side I was expecting a smaller version of that and hoping the cheese was “gooey” as the description promised. Well…I was wrong about one thing – the size. The plate that came out full of fries was enough to feed three, and the cheese was perfectly melty and gooey like I had hoped. 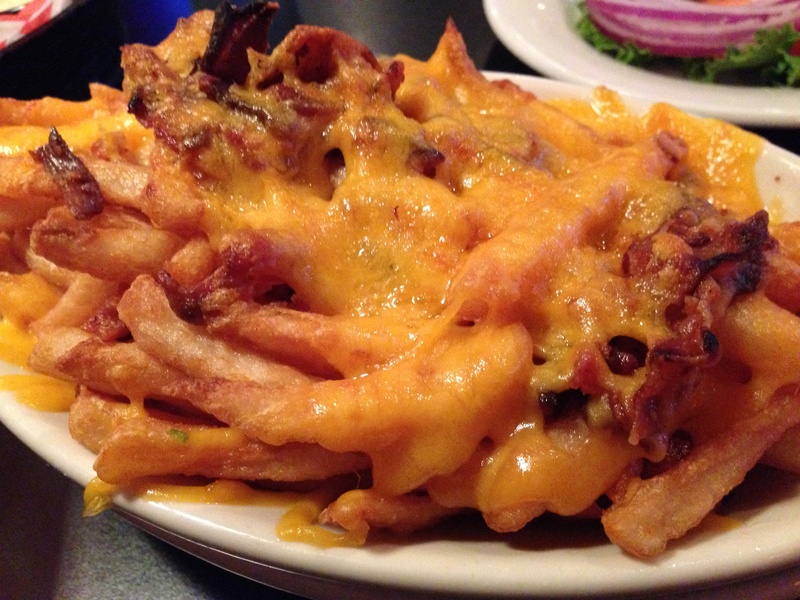 The fries were crispy and the topping was actual melted cheese (not something synthetic and tasteless) with bacon. Other than being overwhelmed by the portion size I was super happy with the upgrade! FOODNOTES: Don’t go to Monk’s if you want something healthy. 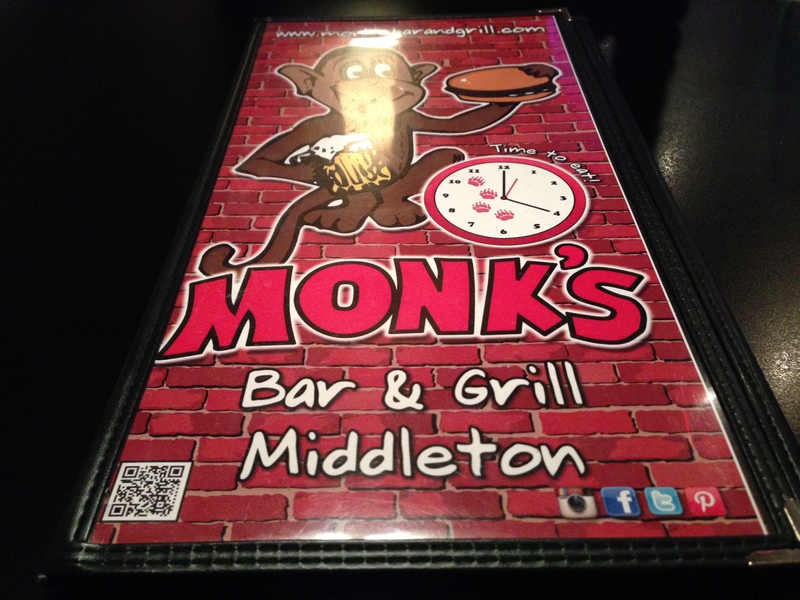 If you’re looking for a decent burger and a lot of food – head to Monk’s. This would be a great place for a family to come and split a couple appetizers and upgraded sides for cheap…that’s how big these portions are. I was too full for dessert so I’m not sure if they’re worth it, but based on the frozen, pre-prepared fried pickles, the desserts probably come in the same way. The service at the Middleton location was good but we were one of three tables at the time. I probably won’t be back because nothing was super impressive, but it would be a good spot to watch a game and munch of some monkey fries!